If you’re a coxswain whose parents are wondering what you actually do in the boat, or why so many big athletes listen to you, even though you’re a fraction of their size, or why you get so jazzed by putting on a microphone and steering a 60-foot-long shell down a straight race course, hand them this article. If you’re a parent wondering all of those same things, read on. The Donkersleys, a family in Phoenix, Arizona, have been there. The world of high school and Junior coxing is large and complex; through their daughter’s experience as a high school coxswain, they share some lessons. Maybe you’ve heard coxing described this way: a mental chess game. Or maybe, if you’ve coxed, you’ve felt it yourself, as you looked across the boats during a sprint race and tried to find the words that would bring your crew to their best performance, nudging your bow ball ahead of all of the other boats. Coxing is, by all accounts, the most mental seat in the boat, a constant bout between your mind and the rower’s bodies, the efforts of the rowers coming to you through the hull of your boat while you try to capture that next bit of water away from your opponent. For Rochelle Donkersley, coxing wasn’t the first time she played this mental chess game. For Donkersley, a high school-aged coxswain in dry and arid Phoenix, Arizona (yes, there’s rowing in Phoenix, on nearby Tempe Town Lake), the mental chess game she played first was in a fencing uniform. “Fencing is a solitary sport,” she says, when we talk, just after she’d coxed her crew at the San Diego Crew Classic, “a stand-up chess game.” She smiles, “The mental strategy crosses over into coxing.” Hearing this comparison, I wait for the young, astute coxswain to go on. “Fencing is about predicting what your opponent is going to do. It’s the same in racing, really. You have to make a move before they do, or you have to counteract their move.” Donkersley is humble, knowing that her experience as a high school coxswain is just the beginning of her career. “I listen to recordings, go to coxswain-specific camps and read everything I can about coxing. I try to learn as quickly as I can.” Donkersley has coxed for her high school, Xavier Prep, in Phoenix, and has also spent time coxing for a Masters club. Although coxing was Rochelle's idea, she was encouraged by her parents, Jason and Tishin. They bought her The Short and Snarky Guide to Coxing and Rowing, one of the premier books on coxing. Her parents had supported her in fencing, but the team aspect of crew seemed better suited to her personality. As a smallish athlete, the coxswain seat was best for her. And, says her mother, Tishin, it helped her daughter find that side of her personality that was bigger and more assertive than she had known before. Coaches will teach the basics of steering and safety, but the cox needs to work with the crew to successfully drive the boat, since the crew acts as the engine. Once the boat is launched, if your son or daughter is coxing, their next focus is on steering straight down the course and executing the practice plan or the race plan, depending on the day. If it’s a practice day, the coxswain will listen to the coach (who is riding alongside the crew in a motorized launch) and then relay the next drill or speed sequence to the crew. The cox will call the parts of the stroke that the coach is focusing on, reinforcing the changes the coach has asked for. It’s here that young coxswains learn to listen. Even though many people think that coxswains are in-boat coaches, it’s not necessarily true during practices. The cox’s job is to focus on the drills and skills the coach is trying to introduce to the rowers. Typically, the saying goes, there is no talking in the boat, except for the coxswain. If you have a child who is good at describing new tasks with clear and articulate words, coxing may be a good fit. Coxswains should listen more than they talk, however. This is part of what makes the coxswain’s seat so demanding. Every coxswain will come to a moment when they realize they are a part of the crew, but they also have to call for more effort, or technique changes, or more power from the rowers. It’s a double-edged sword, one that is often likened to management skills. You’re a part of the crew, but you are also the leader. 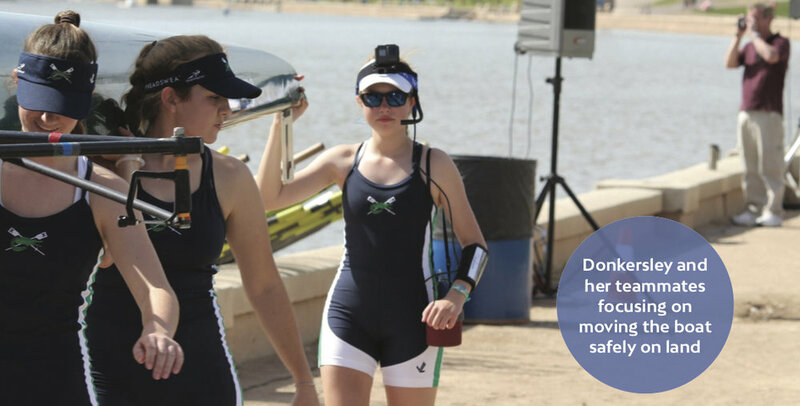 Verbal finesse is critical to a coxswain’s success. If it’s race day, your son or daughter coxswain will have a warm-up plan and a race plan they've practiced with the crew and plan to use. They have to launch the boat, go through a series of drills and stroke sequences to ensure their rowers are ready to race and arrive at the starting line at just the right time to get in position for the start–not too early and not too late. It's a good idea to get your son or daughter coxswain a waterproof watch. Once the race begins, the coxswain turns into an informant, a bit of a drill sergeant and a motivator, all at the same time. The coxswain should be the only person in the boat looking across the lanes (even the turn of one rower’s head can off-set the boat when it’s at racing speed). They let the crew know if they’re ahead or behind other boats, and by how much. Both the cox and the rowers know the race plan, and exactly how many strokes happen during each part. The cox will call the stroke changes (rate, power, focus) throughout the race, trying to keep the crew synchronized and powerful. As the race nears completion, the intensity goes up. Way up. If a crew is leading, they know they’re being chased by every other crew. They also know that one missed stroke can change the outcome of a race. The cox has to feel if the crew is at their maximum effort, or if they can squeeze an extra ounce of power out of each stroke without tipping over their own abilities and risk missing a stroke (this is called "catching a crab," when an oar is caught by the water in an unstable position and gets stuck underwater, effectively stopping the boat). It is here, at the height of the intensity, that rowers must trust themselves, their rowing, and their coxswain.